Nephron is the basic structural and functional unit of the vertebrate kidney, with numerous such filtering units carrying out nearly all the functions of the kidney. The chief function of neprhons is to regulate the concentration of water and soluble substances like sodium salts by filtering the blood, reabsorbing what is needed, and excreting the rest as urine. A nephron eliminates wastes from the body, regulates blood volume and blood pressure, controls levels of electrolytes and metabolites, and regulates blood pH. The nephrons' functions are vital to life. In human beings, there may be a million nephrons in each kidney. These are involved in intricate coordination with other systems to provide homeostasis for the body, remove wastes, and retain important nutrients. For example, in the presence of antidiuretic hormone (ADH or vasopressin), the ducts in the nephrons become permeable to water and facilitate its reabsorption, thus concentrating and reducing the volume of the urine. However, when the organism must eliminate excess water, such as after excess drinking, the production of ADH is decreased and the collecting tubule becomes less permeable to water, rendering urine dilute and abundant. Breakdown in this harmonious coordination can result in failure to decrease ADH production appropriately, leading to water retention and dangerous dilution of body fluids, which in turn may cause severe neurological damage. Failure to produce ADH (or inability of the collecting ducts to respond to it) may cause excessive urination. Because of its importance in body fluid regulation, the nephron is a common target of drugs that treat high blood pressure and edema. These drugs, called diuretics, inhibit the ability of the nephron to retain water, thereby increasing the amount of urine produced. A kidney is a bean-shaped excretory organ in vertebrates. Part of the urinary system, a kidney filters and excretes wastes from the blood, principally nitrogenous wastes originating from protein and amino acid metabolism. One such waste is urea, which is excreted, along with water, as urine. The two kidneys in human beings are located in the posterior part of the abdomen, in the lumbar regions, with one on each side of the spine. The basic functional unit of the kidney is the nephron. In humans, a normal adult kidney contains 800,000 to one million nephrons within the cortex and medulla (Guyton and Hall 2006). Nephrons regulate water and soluble matter (especially electrolytes) in the body by first filtering the blood under pressure, and then reabsorbing some necessary fluid and molecules back into the blood while secreting other, unneeded molecules. The action of nephrons are regulated by the endocrine system by hormones such as antidiuretic hormone, aldosterone, and parathyroid hormone (Maton et al. 1993). Two general classes of nephrons are cortical nephrons and juxtamedullary nephrons, both of which are classified according to the location of their associated renal corpuscle. Cortical nephrons have their renal corpuscle in the superficial renal cortex, while the renal corpuscles of juxtamedullary nephrons are located near the renal medulla. The nomenclature for cortical nephrons varies, with some sources distinguishing between superficial cortical nephrons and midcortical nephrons. 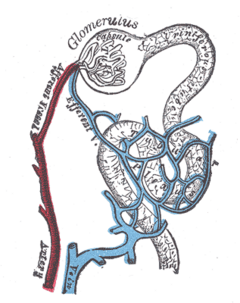 The term nephron comes from the Greek νεφρός [nephros], meaning "kidney." The medical field that studies the kidneys and diseases affecting them is called nephrology. Glomerulus is red; Bowman's capsule is white. Each nephron is composed of an initial filtering component (the "renal corpuscle") and a tubule specialized for reabsorption and secretion (the "renal tubule"). The renal corpuscle filters out large solutes from the blood, delivering water and small solutes to the renal tubule for modification. Composed of a glomerulus and Bowman's capsule, the renal corpuscle (or Malpighian corpuscle) is the beginning of the nephron. It is the nephron's initial filtering component. 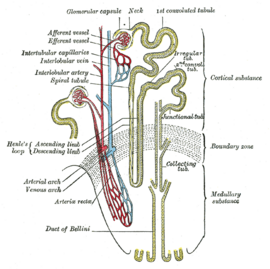 The glomerulus is a capillary tuft that receives its blood supply from an afferent arteriole of the renal circulation. The glomerular blood pressure provides the driving force for water and solutes to be filtered out of the blood and into the space made by Bowman's capsule. 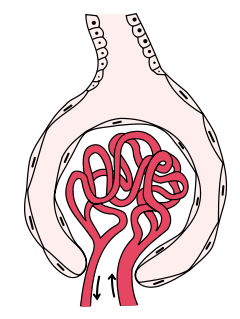 The remainder of the blood (only approximately 1/5 of all plasma passing through the kidney is filtered through the glomerular wall into Bowman's capsule) passes into the narrower efferent arteriole. It then moves into the vasa recta, which are collecting capillaries intertwined with the convoluted tubules through the interstitial space, in which the reabsorbed substances will also enter. This then combines with efferent venules from other nephrons into the renal vein, and rejoins the main bloodstream. The Bowman capsule, also called the glomerular capsule, surrounds the glomerulus. It is composed of a visceral inner layer formed by specialized cells called podocytes, and a parietal outer layer composed of a single layer of flat cells called simple squamous epithelium. Fluids from blood in the glomerulus are filtered through the visceral layer of podocytes, and the resulting glomerular filtrate is further processed along the nephron to form urine. The renal tubule is the portion of the nephron containing the tubular fluid filtered through the glomerulus. After passing through the renal tubule, the filtrate continues to the collecting duct system, which is not part of the nephron. The loop of Henle, also called the nephron loop, is a U-shaped tube that extends from the proximal tubule. It consists of a descending limb and ascending limb. The juxtaglomerular apparatus is a specialized region of the nephron responsible for production and secretion of the hormone renin, involved in the renin-angiotensin system. This apparatus occurs near the site of contact between the thick ascending limb and the afferent arteriole. It contains three components: the macula densa, juxtaglomerular cells, and extraglomerular mesangial cells. The physiology of the nephron is complex and is exploited by many drugs called diuretics. The nephron carries out nearly all of the kidney's functions. Most of these functions concern the reabsorption and secretion of various solutes such as ions (for example, sodium), carbohydrates (for example, glucose), and amino acids (such as glutamate). Properties of the cells that line the nephron change dramatically along its length; consequently, each segment of the nephron has highly specialized functions. The proximal tubule as a part of the nephron can be divided into an initial convoluted portion and a following straight (descending) portion (Boron and Boulpaep 2005). Fluid in the filtrate entering the proximal convoluted tubule is reabsorbed into the peritubular capillaries, including approximately two-thirds of the filtered salt and water and all filtered organic solutes (primarily glucose and amino acids). The loop of Henle, which is the U-shaped tube that extends from the proximal tubule, begins in the cortex, receiving filtrate from the proximal straight tubule, extends into the medulla as the descending limb, and then returns to the cortex as the ascending limb to empty into the distal convoluted tubule. The primary role of the loop of Henle is to concentrate the salt in the interstitium, the tissue surrounding the loop. Considerable differences distinguish the descending and ascending limbs of the loop of Henle. The descending limb is permeable to water but completely impermeable to salt, and thus only indirectly contributes to the concentration of the interstitium. As the filtrate descends deeper into the hypertonic interstitium of the renal medulla, water flows freely out of the descending limb by osmosis until the tonicity of the filtrate and interstitium equilibrate. Longer descending limbs allow more time for water to flow out of the filtrate, so longer limbs make the filtrate more hypertonic than shorter limbs. Unlike the descending limb, the ascending limb of Henle's loop is impermeable to water, a critical feature of the countercurrent exchange mechanism employed by the loop. The ascending limb actively pumps sodium out of the filtrate, generating the hypertonic interstitium that drives countercurrent exchange. In passing through the ascending limb, the filtrate grows hypotonic since it has lost much of its sodium content. This hypotonic filtrate is passed to the distal convoluted tubule in the renal cortex. The distal convoluted tubule has a different structure and function to that of the proximal convoluted tubule. Cells lining the tubule have numerous mitochondria to produce enough energy (ATP) for active transport to take place. Much of the ion transport taking place in the distal convoluted tubule is regulated by the endocrine system. In the presence of parathyroid hormone, the distal convoluted tubule reabsorbs more calcium and excretes more phosphate. When aldosterone is present, more sodium is reabsorbed and more potassium excreted. Atrial natriuretic peptide causes the distal convoluted tubule to excrete more sodium. In addition, the tubule also secretes hydrogen and ammonium to regulate pH. After traveling the length of the distal convoluted tubule, only about 1 percent of water remains, and the remaining salt content is negligible. Each distal convoluted tubule delivers its filtrate to a system of collecting ducts, the first segment of which is the collecting tubule. The collecting duct system begins in the renal cortex and extends deep into the medulla. As the urine travels down the collecting duct system, it passes by the medullary interstitium, which has a high sodium concentration as a result of the loop of Henle's countercurrent multiplier system. Though the collecting duct is normally impermeable to water, it becomes permeable in the presence of antidiuretic hormone (ADH). ADH affects the function of aquaporins, resulting in the reabsorption of water molecules as it passes through the collecting duct. Aquaporins are membrane proteins that selectively conduct water molecules while preventing the passage of ions and other solutes. As much as three-fourths of the water from urine can be reabsorbed as it leaves the collecting duct by osmosis. Thus the levels of ADH determine whether urine will be concentrated or diluted. An increase in ADH is an indication of dehydration, while water sufficiency results in low ADH allowing for diluted urine. Lower portions of the collecting duct are also permeable to urea, allowing some of it to enter the medulla of the kidney, thus maintaining its high concentration (which is very important for the nephron). Urine leaves the medullary collecting ducts through the renal papillae, emptying into the renal calyces, the renal pelvis, and finally into the urinary bladder via the ureter. Because it has a different origin during the development of the urinary and reproductive organs than the rest of the nephron, the collecting duct is sometimes not considered a part of the nephron. Instead of originating from the metanephrogenic blastema, the collecting duct originates from the ureteric bud. Boron, W. F., and E. L. Boulpaep. 2005. Medical Physiology: A Cellular and Molecular Approach. Philadelphia, PA: Elsevier Saunders. ISBN 1416023283. Guyton, A. C., and J. E. Hall. 2006. Textbook of Medical Physiology. Philadelphia, PA: Elsevier Saunders. ISBN 0721602401. Maton, A., J. Hopkins, C. W. McLaughlin, S. Johnson, M. Quon Warner, D. LaHart, and J. D. Wright. 1993. Human Biology and Health. Englewood Cliffs, NJ: Prentice Hall. ISBN 0139811761. All link retrieved November 15, 2018. Why Do We need Kidneys? A Whistlestop tour of renal physiology for medical students. This page was last modified on 15 November 2018, at 23:42.